All 955 workers from a gold mine in South Africa have been safely brought back to the surface. They had been trapped underground since a power cut struck on Wednesday night, and back-up generators failed to work. "Everybody's out," said James Wellsted, a spokesman for the operating firm Sibanye-Stillwater. He said there were "cases of dehydration and high blood pressure but nothing serious", and the mine would re-open on Monday. 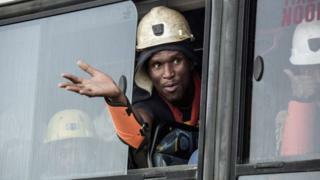 The BBC's Pumza Fihlani in South Africa says there were scenes of jubilation as the miners were brought to the surface in the morning. Through the night, members of the local community and other workers had kept vigil outside the mine shaft, praying for the miners' safe return. South Africa is a leading gold producer, but safety in the industry is often questioned. The Beatrix mine is in Welkom town, about 290km (180 miles) south-west of Johannesburg. It is owned by Sibanye-Stillwater mining firm. It has 23 levels, going down to 1,000 metres (3,280 ft) below ground. Image caption "My children couldn't sleep," says Nontuthu Zelo Ngcai, a relative of a miner. She says worried family members called her through the night. The accident is thought to have occurred when a storm knocked over an electricity pylon close to the site, triggering a huge power cut. But on Friday morning electricity was finally restored to a lift, enabling the workers' release. "It was stressful, there was not enough ventilation," said mineworker Mike Khonto. "Thankfully our management managed to send us food and water." They are being taken for food and showers upon their release, before having medical health checks. Anxious family members had gathered along the road to the mine but were kept back by security forces. Mr Wellsted said there was "no indication so far that anyone has been in distress" but it had been a "traumatic experience". Trade union officials had previously said they feared that the lives of the miners were at risk. They say this accident has highlighted the low safety standards in parts of the industry.